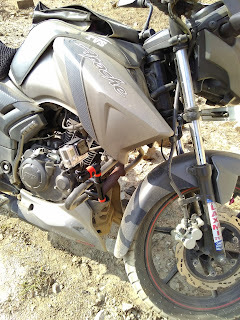 One and a half years ago, when I bought my Apache, I was searching for a community of bike riders in Chennai whom I could join and go on long rides. While Bangalore had many such groups active, to my surprise I couldn’t locate any active biking community in Chennai. There was Madbulls, but that was for Royal Enfield owners. Few premium bikes like KTM had their groups. Chennai trekking club occasionally might organize a bike ride+ trek, but that is not frequent (I went to Yelagiri with them in 2009). Apparently there were no active groups for generic bikers for occasional long rides (if there was one, I couldn’t locate it- checked with few friends also, they were equally clueless). I did a solo ride to Bengaluru, another ride to Yelagiri and few rides to nearby Pondicherry and that was about it. I checked with few colleagues who had bikes and in principle we agreed that we will go on a long ride together- but that never became reality- few dates I shortlisted didn’t work out for them and I had many out of city travel and bike ride became secondary. Also because I am more inclined towards cars than bikes, didn’t pursue this actively. 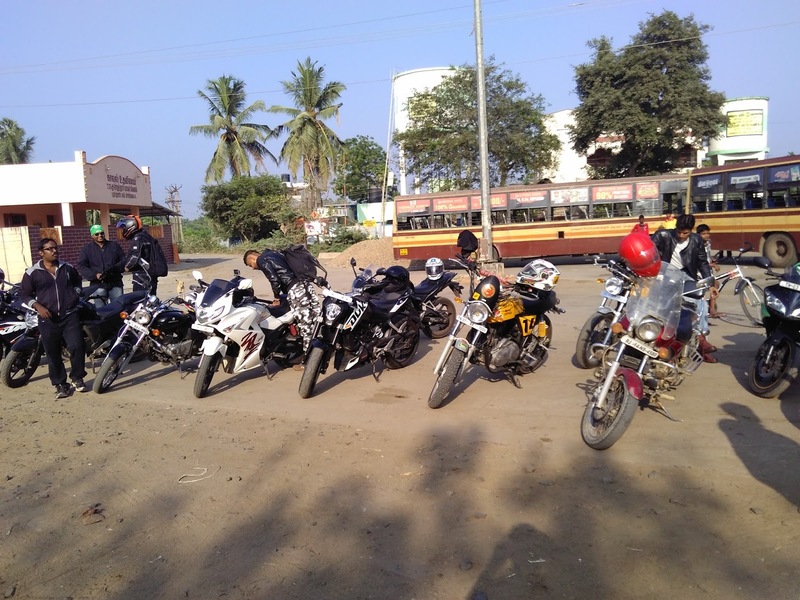 Recently Thirukumaran Saravanan, co-founder of firm called DreamWare that provides virtual reality and augmented reality solutions, posted pictures of his weekend ride with a group called Chai Sutta Ride. I asked him when is the next ride and learnt that it will be in 2 weeks. Followed their facebook group, signed up for the next ride, which was planned for last Sunday. The destination was not communicated upfront, but previous evening organizers posted few photos- it was a quarry somewhere outside Chennai. We teamed up as planned at BP Fuel station on Cathedral road. I learnt that the community is about 6 months old. About 25-30 bikers joined and we set off at 7. We rode along and hit the highway. For a moment my bike started shaking violently. 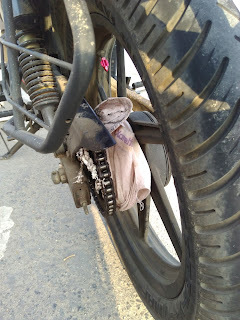 I pulled over and saw that a big piece of shirt has got into my chain & sprocket. Took me a few minutes to get rid of it- had to rotate the wheel, tear the cloth into pieces and get it out piece by piece. By the time I was done, the convoy was gone. But after a brief interaction with Saravanan, who shared his current location, I figured out the way and joined them in a few minutes. Few other riders also had taken wrong turn and had to be re-united. Once again, we rode off. We reached Pazhanthandalam, which was a small town on the outskirts of Chennai (Bus No 55B, 55A originate here). From here the off-roading started- we rode on the track meant for tipper lorries that carry tons and tons of granite extracted from quarries. Battling dust, sharp stones and uneven roads, we reached the quarry, rode a bit closer, took some pictures and headed back. It was good opportunity for me to test the Joby Action Clamp GoPro stand that I had picked up in Singapore earlier this year. I had to keep looking at the camera every few seconds just to be sure that it didn’t fall off. The stand proved to be sturdy enough to survive bad roads. The last leg involved a short ride inside the cashew plantation (no season yet) and a tea break close to the highway. By about 10 AM we were done with the ride and headed home. Unfortunately we forgot to take good group picture. Was a good break to take on a Sunday morning. - Rides are of moderate distances- about 150-200 kms total, lasting about half a day- a good refresher ride. Leaves you with enough time from the weekend for other activities. Organizers do a reccee previous day, so they are spending some time and fuel planning the ride. It should be fine if they accept a token registration fee to cover their time and expenses. Anyways, Summer is here and now it is too hot for long bike rides, so we learnt that next ride will be after few months. 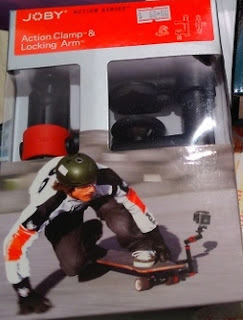 Its really very much useful information for the new generation that how it handle your bike smoothly. Coming Soon-10 different taxes on Bloggers!